It’s been a while since I’ve entered a photography competition (a couple of years at least), but it’s nice to do so every so often. It’s the opportunity to put your best work up against that of other professionals and see how it compares. So I was delighted to be informed a few weeks ago that I’ve been awarded Nominee status for four photographs that I entered into the 11th Annual International Color Awards (forgive the spelling, but it’s an American based competition). The Awards attracted 5642 entries from 73 countries, so to have collected four nominations … well, I’m chuffed to say the least. Especially as the categories I entered into aren’t the kinds of photography that I shoot day-in and day-out. Two of the awards were in the Architecture category. 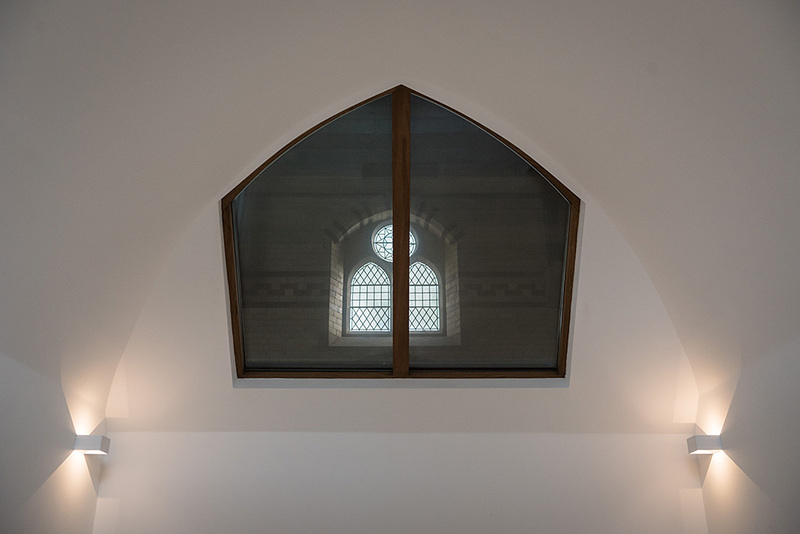 Both shots were taken on an interiors shoot for Promat windows, who had installed the fire resistant windows in this Church redevelopment scheme. As you can see, it’s a pretty spectacular design inside the old church, and I’m glad I could do it justice. I’m actually more pleased that the second shot received an award. I’m a strong advocate that ‘Less is More’, and this shot sums up that approach. I tried to strip the photo down to the essentials, trying to create a minimalistic image that still got the message across. I’m glad that the judges agree! The two other winners came from a shoot for Pressvess, a fabrications company based in the West Midlands. I spent a day in the foundry, creating marketing images for the company. The first shot was entered in the People category (a category I spend a lot of time shooting), but this shot was different to my usual work. It’s an upright image (shot with an eye to being the cover of an end of year report, or to go on a marketing brochure) which illustrates the gist of what the company does without being too obvious about it. Compositionally, I created it with a lot of dead space, so that if used for marketing there was ample room for dropping in text. The second image from this commission was entered in the Silhouette category. This is not something I shoot frequently, but I knew that the position of the welder on the tank would generate more than one worthwhile shot. By moving around the foundry, looking close and stepping back, I was able to find this graphic shot. To me, it’s an environmental portrait, but the starkness of the lighting renders it a near-silhouette, which created the mood I was looking to present. Many thanks to the judging panel, which included representatives of such august bodies as Christie’s, Paris; Grey Group, New York; The Art Channel, London; Ogilvy & Mather, Amsterdam; Publicis Conseil, Paris; Preus Museum, Norway; Art Beatus, Hong Kong; Netflix, Los Angeles; Whitechapel Gallery, London; and Phillips, New York. An esteemed panel, and it’s flattering indeed to have my work recognised by them. And to my clients, for providing the wonderful opportunity to create these images for you. It’s nice to share the plaudits with you.